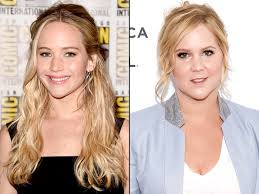 You, Me and Movies: Jennifer Lawrence and Amy Schumer are writing a movie? Jennifer Lawrence and Amy Schumer are writing a movie? Amy Schumer and Jennifer Lawrence are going to write a movie together. I have really enjoyed Jennifer Lawrence's career so far. When I saw her for the first time, it was on a cool summer's night as I strolled into a Peoria theater to see "Winter's Bone." Her first big performance blew my mind completely, and I had a deep feeling that Lawrence would become something special, and sure enough she has. Whether its independent fair like "Bone" or Mainstream Oscar bait like "American Hustle" and "Silver Linings Playbook" or gargantuan blockbusters like "X-Men" or "Hunger Games," Lawrence delivers. I don't know if any of you think she's overrated, but I certainly would argue for her merits. Then there is Amy Schumer. Look, I do dig Amy's stand-up and her appearances on talk shows is quite charming. But "Trainwreck" was just...blah. I couldn't believe just how bad that movie was, and she wrote that film. I give her credit for wanting to explore different dimensions of emotion like any other solid actor would, but "Trainwreck" was a huge miscalculation in my book, and felt like a casual, modern Adam Sandler movie. With that said, I am not sure whether to be excited or not about this. I like one girl's stand up and I just flat out love the other. One has already proven she isn't a screenwriter, but how will the other one fair? Its a tough call. I have to say that I am a little curious to see what they come up with and I am wondering if Lawrence and Schumer will be starring. It will be interesting seeing Lawrence doing some raunchy, slapstick type comedy, if this is the direction they choose to go down. Right now, everything is just speculation.